Fickle Feline: Max Update: The Lion Sleeps Tonight. Max doesn't "officially" nap anymore. That's not to say that he doesn't find a way to catch a few zzz's during the day (usually in the car on the way home from blueballoon). On weekends he typically conks out for a few minutes around 4pm. I took this photo during this afternoon's Chicago-Pittsburgh game, which they were both clearly invested in. Things seem to finally be settling down. This summer was a roller coaster. We increased Max's therapy hours, put him in 2 weeks of music camp, started therapeutic listening, potty trained him, and moved him into the preschool room at daycare. When I add it all up, it suddenly becomes very clear why it was a tough few months. Max's schedule is now set for the Fall. He is in daycare every morning, and spends every weekday afternoon at blueballoon. He also has a session at blueballoon on Saturday mornings. 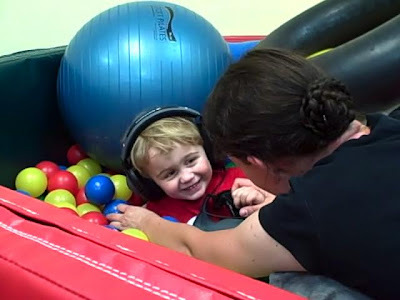 His weekday afternoon sessions start with either Speech Therapy, Music Therapy or Occupational Therapy and are followed by a three hour block of IBI. For the amount of time he spends at the clinic, I feel like he should have his own room with his name on the door. But if ever there was a poster child for early intervention and intensive treatment blocks, Max would be the first in line. When I think back to the child I brought in to be assessed last December, and the child Max has become, the comparison is night and day. When he started, he didn't have any words. He was unable to deal with the simplest transition without having a meltdown. He didn't respond to his name, wave goodbye, or play games, let alone games that required turn taking. He couldn't tolerate large groups of children. He bolted the moment he got the chance. His eye contact was hit and miss, as was his joint attention. He didn't say "mama". I'm not saying he's got everything down perfectly, there is a long, long road ahead of us. But what a difference! The things that I love about Max, is that he has always responded to treatment, and he has always made progress (be it in little steps), and he has always started every day with a huge smile. He is smart as a whip, he loves to tease and flirt, and while many children need tangible or edible reinforcers, all Max truly desires is for you to cheer him on. I don't know where our path will lead us, but this journey teaches me something new everyday. and you and Scott, and his Nana and Bumpa are always there to cheer him on, to love him and to abide with him every step of the way.Little Camie is his cheerleader too. Blessings on Max's team! Yay Team Max! He's doing so amazing!! His progress is awesome to see and he gets more and more handsome every time we see him. Glad to hear things are settling down a bit. You certainly deserve a bit of a break! isn't it great when we can look at our kids and see how far they've come. 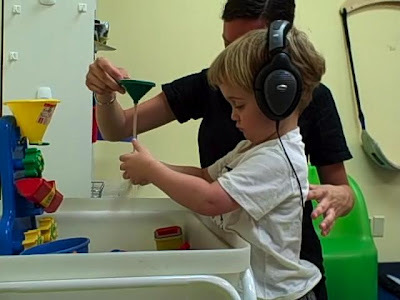 our little guy on the spectrum has also made incredible progress with his in home ABA program and private speech therapy. we have 3 word combinations, spontaneous speech and improved eye contact. we've come a long way since we started treatment 8 months ago. early intervention is so critical and we're so happy we're getting him help early. we just wish that the government funded programs that are supposed to help our kids were actually making a difference. waiting 3 or 4 years is not our idea of early intervention. It's exciting (and encouraging to so many who read) how far Max has come -- he's an amazing little boy! Thank you for making me reflect on my child's improvement. Sometimes we get so caught up in "what's next? what does he need next??" that we forget to enjoy the now and accept how far they've come. I'm enjoying reading your blog, I've been a quiet lurker since you were recommended to me after BlogHer and I will continue to visit.